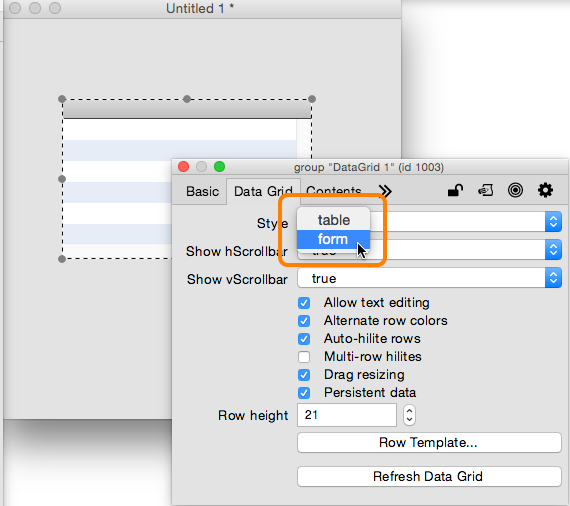 This lesson provides a low detail, step-by-step example of creating a custom data grid form. You can download the sample stack to see the scripts using the link below. This is the data grid that you will create. Each row displays a name, a title and an image. 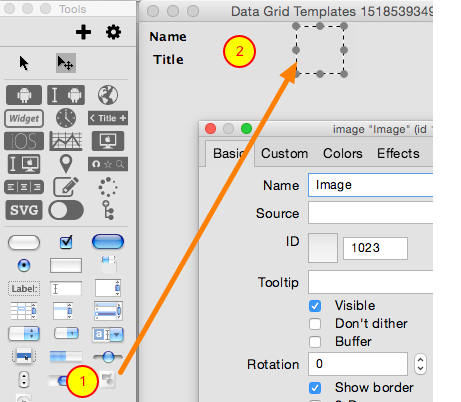 To begin, drag a data grid from the Tools palette onto your card. Bring up the Property Inspector by double clicking on the datagrid. 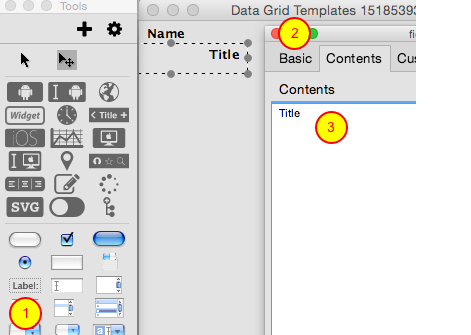 Select the data grid tab and change the style of the data grid to Form. 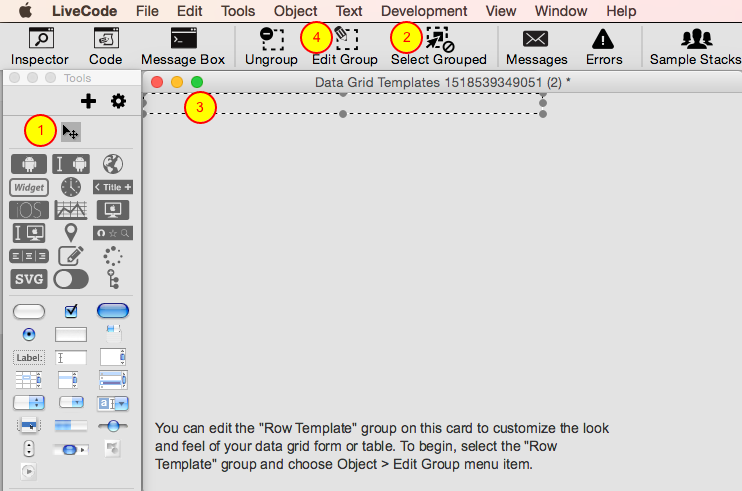 Now you are going to design the row template for the data grid form. The row template dictates how each record in the data grid will be displayed. Before you start editing the row template you need to know about the data that will be displayed each row. This screenshot shows an excerpt from the code that populates the data grid using a multi-dimensional array (look in the card script of the example stack). Each row will have access to the data stored in the FirstName, LastName, Title and ImageURL keys of the array. You are now going to add UI controls to the row template in order to display the data for each of these keys. With the data grid tab selected, click on the Row Template button in the property inspector to open the card containing row template controls. 1) Make sure the Edit tool is selected. 2) Make sure that Select Grouped IS NOT active. 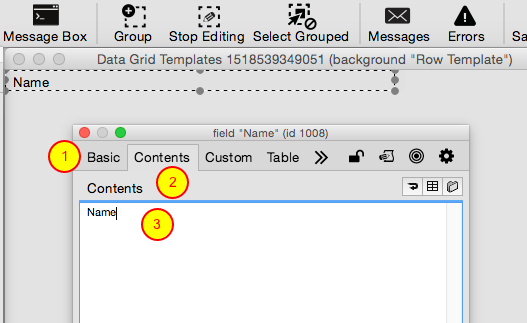 3) Select the row template group. 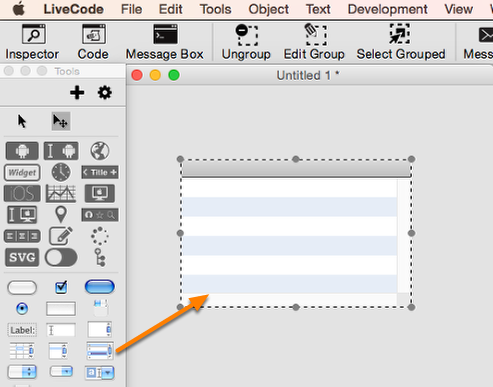 4) Click Edit Group (4) in the LiveCode toolbar. The default template group has a field named "Label". Click on the left side of the gray rectangle to select it. Open the Property Inspector and on the Basic tab change the name of the field to Name. On the Contents tab assign Name as the content (3). With the Name field still selected change the Style to Bold from the Text Formatting tab of the Property Inspector. Drag a label field from the Tools palette (1). Name it Title on the Basic tab (2) and assign Title to the content (3). 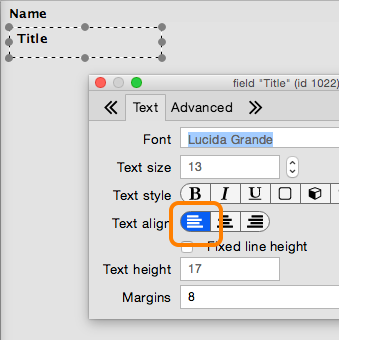 Change the text alignment of the field to the left side using the Text Formatting pane of the property inspector. Resize the "Background" graphic so that it frames the other controls (2). In the example stack the width of the graphic is 214 and the height is 56. NB: The Background graphic is a very slightly darker grey on grey in this template. Click on the background of the template near the top with the Basic tab open until you see you have selected "Background". You are now done adding the UI objects to the row template group. 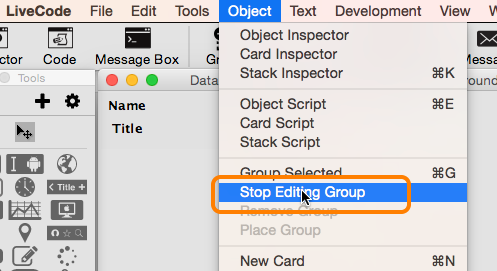 From the Object menu, select Stop Editing Group. Now that you have designed the controls for each row you need to write the script that will move data into the controls and position them on the screen. 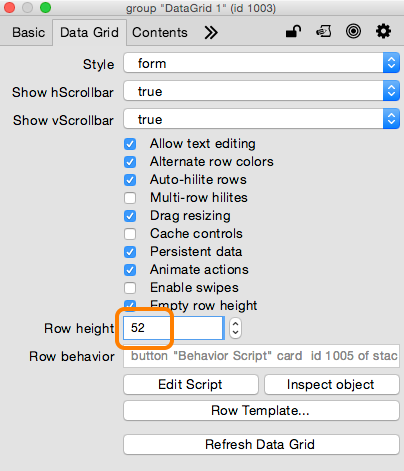 Click on the Edit Script button in the Property Inspector to begin editing the row behavior script. 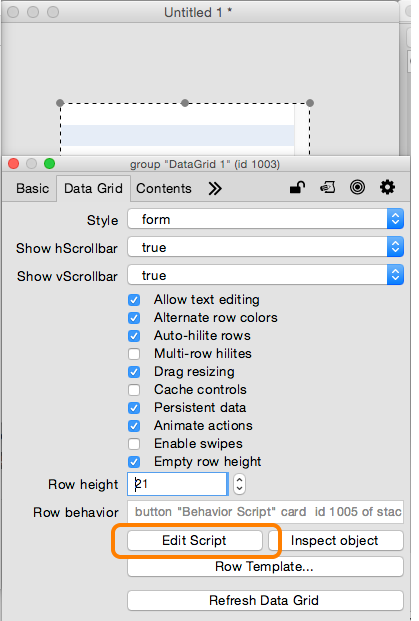 In the script that opens when you click the Row Behavior button you will find a command named FillInData. This is where you move data from the pDataArray parameter into the controls you created. pDataArray is an array with the keys FirstName, LastName, Name and Title. The code that moves the values from the array into the UI controls is pretty straightforward. 1) Assign the values of the FirstName and LastName keys to the Name field. 2) Assign the value of the Title key to the Title field. 3) Assign the value of the Image URL key to the filename property of the image control. You don't need to worry about positioning any of your controls in the FillInData command. You just need to write the code that assigns the data to the UI controls. -- an array containing the records data. -- this message. All resizing should be handled in resizeControl. The LayoutControl message is where you position all of your controls. For this template you begin by positioning the image (1). Next you extend the "Name" and "Title" fields to the edge of the image (2). Finally you resize the "Background" graphic to fill the entire row rectangle. -- This message is sent when you should layout your template's controls. -- The first thing you should do is capture 'the rect of me'. 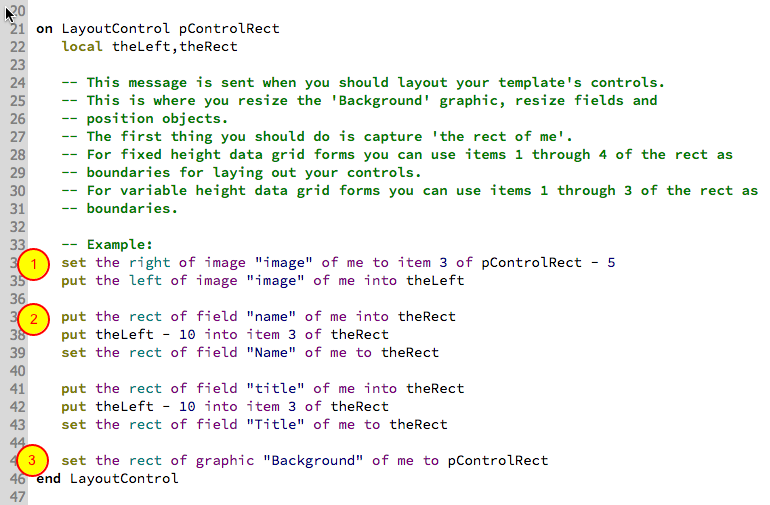 -- boundaries for laying out your controls. This is an example of a handler that populates the data grid with data by setting the dgData property. The dgData property accepts a multi-dimensional array. The first dimensions is an integer representing the row. The second dimension are the key/values you want to pass to each row. You can find this handler in the card script of the example stack. Copy and paste it into your card script (you can open this from the Object menu). 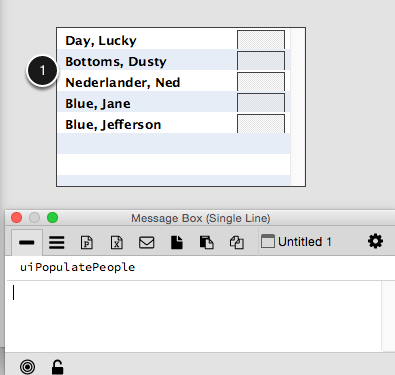 Open the message box and enter uiPopulatePeople, then press enter. 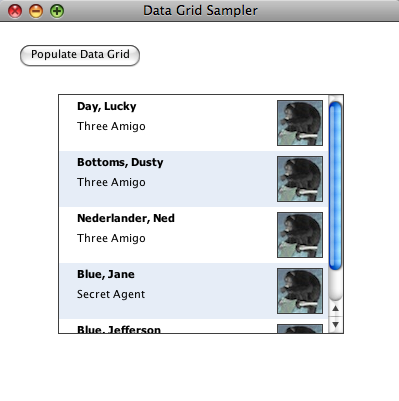 After calling the uiPopulatePeople command the Data Grid should look something like the screenshot above. 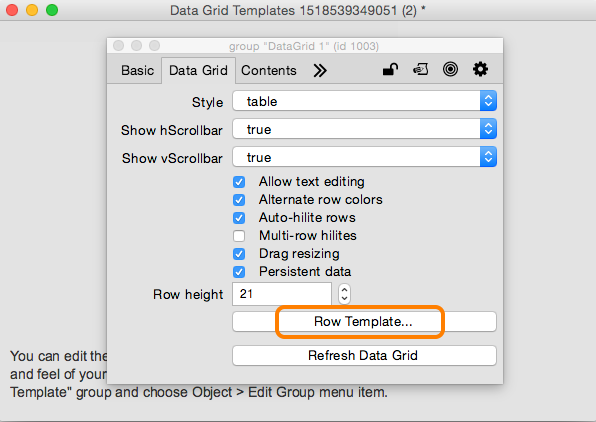 Once you have set the dgData property you can refresh the data grid to see any changes you might make to the row template. You can send the ResetList message to the data grid, or press the Refresh Data Grid button on the Data Grid tab of the property inspector to redraw the data using the updated template. You'll see that the row height in my screenshot is cutting off the images. Open the Property Inspector with the Datagrid selected, and change the row height to 52. 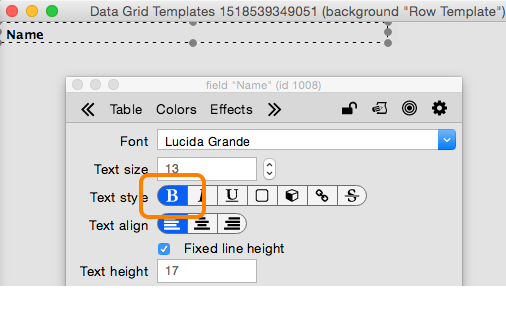 By default a data grid uses a fixed height for each row. If you have not set the row height the first time you populate the data grid with data then the value is automatically filled in based on the height of your row template. If you then change the height of the row template later on you will need to update the row height in the property inspector. Prev: How Do I Create My First Data Grid Form? Next: What Is This "Data Grid Templates" Stack That Appeared in My Project? Hello we are working with the "style form" and trying to integrate the "data grid" with the database. We created some fields to fill it and we want to add the data displayed in the list of the datagrid. We modified the templates ( similar as an example of a list of contacts ) now we are trying to enter the data in the fields of the database and display them. It'll be very helpful were students from Colombia and were learning the world of livecode. The link to download the example stack "or download it here" is a dead link. It is not obvious to me how to call uiPopulatePeople. I'm not sure where the target is, how to define where that script lives. The link has been corrected, you should now be able to download the sample stack. I'm confused about the role of the handler "FillInData". If we were reading the (real) data from disk, each record would contain (in addition to the record number) four fields, in this sequence: "FirstName", "LastName", "Title" and "Image". In the above example, there would be five records, one for each person. And the handler "uiPopulatePeople" would put this data in a container named "dgData" which is a property of the datagrid. Problem: the row template does NOT contain four fields; it contains only three: "name", "title" and "Image". But there is a handler, named "FillInData" which, among other things, does the concatenation of FirstName and LastName, into a field named "Name" which is what we renamed the original field named "Label" to, on the row template. Alternatively, is there a "where used" facility in the IDE? Hi Hugh, thanks for bringing that to our attention. I have updated the lesson with the correction. Hello Rachel, thank you for pointing that out. The link is now fixed. At the risk of filling up the comments with "thank you's", I'm going to do it this time. I appreciate the way you support people. I'm certainly a long way from a good coder, but I'm trying. LiveCode has such a good group of people that you all inspire me to keep going. :) you're welcome. I'm glad you are enjoying your LiveCode experience!